This is a recipe that I've recently revised to make weight loss surgery friendly. I've become famous for making these little babies. In a saucepan over medium heat, bring water and butter to a boil. It's very important to make sure the eggs are added one at a time. Beat until smooth. parchment paper so it's easier to remove them). Bake for 25 minutes at 400 degrees. 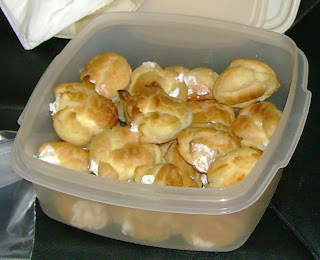 Puffs should be browned on the top and cooked in the middle. In the meantime, whisk milk with pudding. Fold in whipped topping. Refridgerate until ready to fill puffs. Let puffs cool to room temperature. Once cool, fill with pudding mixture using a pastry bag with a bismark tip. and caramel if chosen. Store leftovers in the fridge or freeze.